I am a creature of habit. I eat the same things, I go to the same places, I say the same things...are you catching my drift? I like the same, so there's no surprise that I follow a general morning and the same makeup routine just out of ease and because it works. The only thing that switches from day-to-day for me is my lipstick and my blushes, though my fall colors are very limited and I generally only wear a select few. My things is, if it's not broken, why should I fix it? I think eventually, when I have the time, money and patience, I will pick up a few new products to replace the ones that I have been using religious for years (see: my foundation and concealers). I suppose the joy of having a steady makeup routine is being able to write about it and still have it be accurate weeks later...I kid, I kid. Before I even think about applying my makeup, I always prep my skin by washing and exfoliating (my acne products give me dry skin) with my current cleanser (right now, I'm still using my First Aid Beauty one, but I also love Philosphy, Lush, and The Body Shop cleansers). Then, I put on a layer of moisturizer (currently, Neutrogena's Oil Free Lotion but I have an unhealthy obsession with Origins Ginzing moisturizer). I'll usually wait anywhere between five to ten minutes for this to set in before I start to apply my face makeup. I've been using the same foundation since my freshmen year of college: Covergirl's 3-in-1. I know I should probably switch it up, but I used to have a huge issue with foundations making my skin break out. I have no idea if my skin is still as sensitive as it used to be, but this foundation works really well for me and I am hesitant to change out of fear. I apply this over my Physician's Formula concealer in the shade fair light which I put under my eyes in a V-shape and around my nose and my chin if I have a lot of excess product. If my skin is being particularly pesky or my foundation didn't apply evenly, I use my Covergirl foundation in a compact and used the sponge provided to add a bit extra coverage over trouble areas or to smooth out any foundation lines from my Real Techniques stippling brush. If my skin is particularly rough, like around my period, I will use my Origins Quick Hide! concealer on my trouble spots and redness. I usually proceed with my eye makeup at this point, as I like my foundation and concealer to set before I apply powder to it. But after my eyemakuep, I used a powder to set the places when I applied the extra concealer (currenly, L'Oreal Color Match) and then I use a big fluffy brush and mix together all three shades in my Hourglass Ambient Lighting Palette to give my face and overall glow. I go in with my Too Faced Chocolate Soleil Bronzer (or, occasionally, Tarte's Park Avenue Princess) to use as a contour in the hollows of my cheek, down my neck and jaw, on the sides of my nose and around my temples. My blush shades typically rotate between NARS Sin, Benefit Rockateur, and NYX Terracotta and I apply them closer to my contour and back toward my ear (as opposed to closer to my nose). The final step to my face makeup is my highlighter, which I use mainly on my cheekbones, down the bridge of my nose, my forehead, and on my cupid's bow. Right now, I'm loving the Becca highlighter in Opal, but Mac Soft and Gentle mineralized skin finish is also a favorite. This step always comes between my liquid/creamy face products so I can let them set into place before I try to apply powder on them. The first step to my eyemakuep is always always using an eyeshadow primer. Right now I use Lorac's and MAC Painterly paint pot, but I love the Urban Decay Primer Potion as well. I typically go for a matte neutral eye, using either my Naked palette from Urban Decay or Natural Eye palette from Too Faced. After that, I use my Kat Von D liquid liner to do my usual winged eyeliner and will occasionally set it with Urban Decay's Oil Slick eyeshadow, though it lasts forever long without setting it. My mascara is constantly changing just because I purchased so many samples at the beginning of summer and am finally starting to run out of them, but I always apply it after I put my contacts in. And the last step is to fill in my eyebrows with Anastasia's brow powder and set it with their tinted brow gel. I always tailor my lipstick to what I'm wearing and what I'm doing that day. There is no true rhyme or reason behind it, I just go with the flow! But my favorite lipstick brands are NARS, Revlon, and NYX! 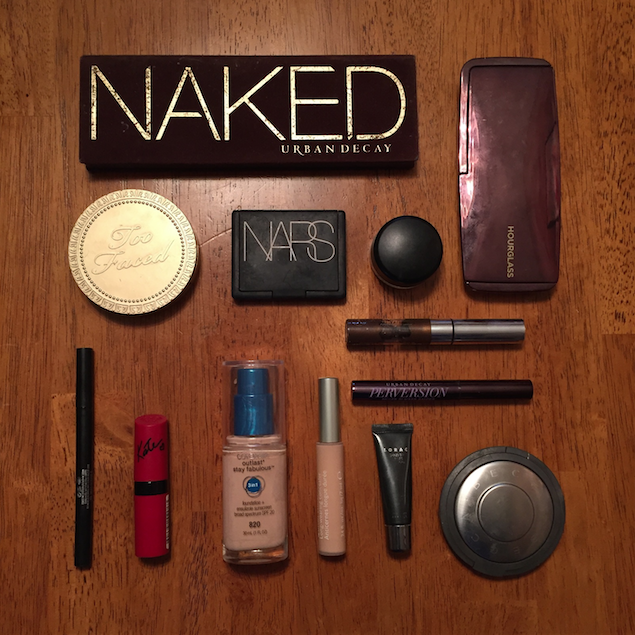 What's your favorite part of your everyday makeup routine? Fran... Do you do all of your makeup and then put your contacts in and then do your mascara? This is very important, I need to know.